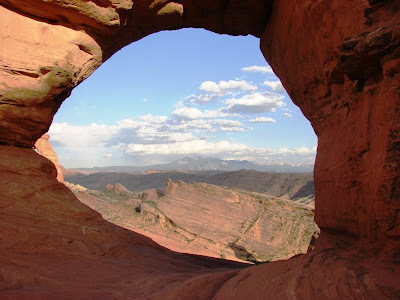 Geotripper: The Real Jurassic Parks: Arches National Park, continued. And an Eminent Threat. The Real Jurassic Parks: Arches National Park, continued. And an Eminent Threat. I didn't really mean to leave everyone hanging in the Jurassic during our months-long tour of the geology of the Colorado Plateau, but I am easily distracted by things like work and politics. I want to at least make it out of the Mesozoic era before Thanksgiving, so I am picking up the thread where we left off on Oct. 17 with a visit to Arches National Park. The stratigraphy of the park is relatively straightforward: the visible scenery mainly includes the Navajo Sandstone, the Dewey Bridge member of the Entrada Sandstone, and the Slickrock member of the Entrada. The Navajo Sandstone has a huge role in the scenery of other parks on the Plateau (see discussions here), but is mostly muted here. It is familiar to park tourists as the "petrified sand dunes" that can seen along the road in the south part of the park, and the very dramatic white rock along the park entrance road. The Dewey Bridge member is a "crinkly" layer of sand, silt and gypsum at the base of many of the arches. The reason for the deformed layers is unclear. One intriguing proposal is that a nearby asteroid impact distorted the layers (Upheaval Dome in Canyonlands National Park is the proposed impact site). 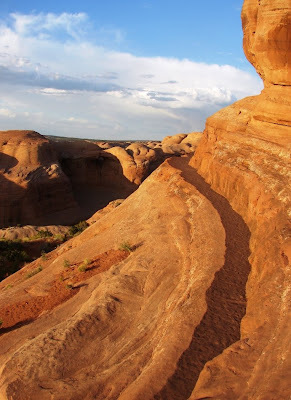 Most of the arches occur in the Slickrock member, a cliff-forming layer that is obvious throughout the park. The origin of the park's famous arches (there are hundreds) is tied to the salts of the Paradox Basin discussed earlier in this post. The salt beds are thousands of feet thick, and when placed under pressure, can slowly flow upwards through the overlying rock, forming domes and anticlines (upward pointing folds). Over millions of years, erosion removed thousands of feet of overlying sediment, and the salt was close enough to the surface to be affected by groundwater: it was dissolved away. The tops of the folds collapsed inwards, and the Entrada Sandstone was fractured (jointing) into a series of parallel fins. A large northwest trending anticline crosses the park; most of the arches occur along the flanks of the anticline. The top of the fins are exposed to the arid desert climate, where the rock dries quickly following the infrequent storms. At the base of the fins, where the rock is buried by soil and loose sand, the rock may stay moist much longer. This leads to the solution of the cement holding the sandstone together, and the fins start to weather from below. Eventually a small window may open up, and falling slabs of rock enlarge the opening. 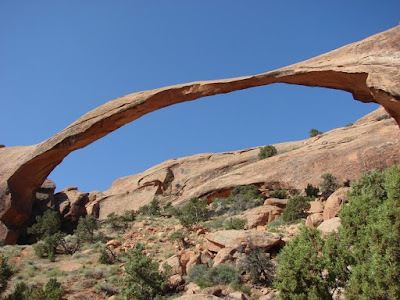 The largest arch, Landscape, has an opening the length of a football field. Unfortunately, it is so thin and fractured that it may not last our lifetimes (it is in the third picture of the day). A large chunk fell about fifteen years ago. Wall Arch, another arch in the same area, just collapsed last summer. Today's first photograph shows a small arch in the vicinity of Delicate Arch (a corner of Delicate is visible on the left side). The foreground includes tilted layers of the Entrada where they collapsed into the salt anticline. The La Sal Mountains can be seen in the distance. The second photo shows my nomination for one of the most dramatic trails in existence, the one that leads to Delicate Arch. This is definitely a case where the end of the trail is not the main attraction; the whole trail is a treat, from one end to the other. Unfortunately, politics and politicians don't stop politicking, elections or not. Arches, like the Grand Canyon is being threatened by the possibility of gas drilling just outside the park boundaries. The outgoing administration seems to be trying to run a fire sale on leases before they leave office in January. It is especially irritating that the Bureau of Land Management seems to be trying to fly under the public radar in their announcements. More information on the issue (and maps of the proposed leases) can be found here.